This story originally appeared in Spoke Magazine. Another, fuller version also ran in Privateer Magazine. Before you read this, let me give you some background to the story: I’d just spent the previous ten months traveling almost non-stop (in fact, I’d been traveling for a lot longer than this but 2011 had been a particularly global year) and I’d started to see cracks in the idea of traveling to the ends of the earth to ‘explore new horizons, man’. I’d started to see that the mountain bike media landscape was full of stories of riders attempting to ‘find untouched trails’, ‘shred virginal singletrack’ and ‘go where there had been no tires before’, but this whole concept seemed utterly sanctimonious and a deception of the truth in such ‘adventures’. I’d spent years dreaming about Nepal and when I got there I was surprised to see how much we were swept into the tourism machine. 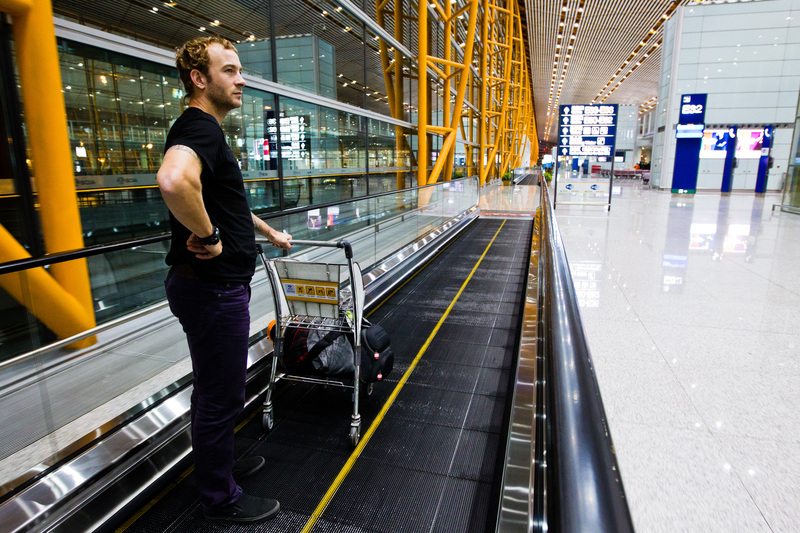 From the moment we left the airport we were put onto what felt like a conveyor belt that was designed to show us the sites and the sights in the most efficient manner possible. It wasn’t exploring or adventurous, and for that I was a little disappointed (it was my wrongdoing to expect it any other way, I see that now). Anyway, this story conveys my feelings at this specific moment about globalization, tourism, and inflated egos. It’s not that we didn’t have any genuine and intimate moments of discovery away from the machine, in fact there were many more than this article probably alludes to, the day we spent doing wheelies with kids in remote villages far away from the hiker traffic around Kathmandu, Pokhara, Annapurna or Everest Base Camp. I would dearly love to go back because the next time I’d know what to expect and what not to expect. Often, travel stories are full of sensationalized or self-satisfied anecdotes of adventure, exploration and extreme danger. But are these tales true? In a globalized society where travel and recreation is no longer considered a luxury but almost a basic human right, is it possible for mountain bikers to really travel to extremes and venture where no man has been before? In November 2011 I was invited to join a Big Mountain Adventures trip to Nepal. I shared this experience with twelve strangers who had booked their way into a personal odyssey. Our guides had been riding these trails for twenty years before we arrived to lay down our skid marks, and in that time they had chaperoned an untold number of riders on this route. Mountain biking isn’t all about first descents and ripping sinewy, virgin singletrack. It just can’t be. Like locomotive trains we need tracks and trails to rail our bicycles upon. Anywhere you travel to ride trails, chances are you aren’t going to be the first person to do so. Trails are just dirt highways and freeways, and you are just another set of tyres in a long stream of commuters. Tourism is big business. I’m talking really big, like being responsible for an estimated 5% worldwide GDP-big. Everywhere is sold up and wrapped up. In the time it took your great grandfather to walk to school and back you could board a plane, travel to the other side of the globe and be sipping a glass of the local brew. The history and legacy of tourism in Nepal is deep and profound. It is visited by packs of travellers and herds of tourists each year, and although the landscape hasn’t been scarred by the commercial operation of tourism, the structure of Nepalese enterprise has been forever pock-marked by it. 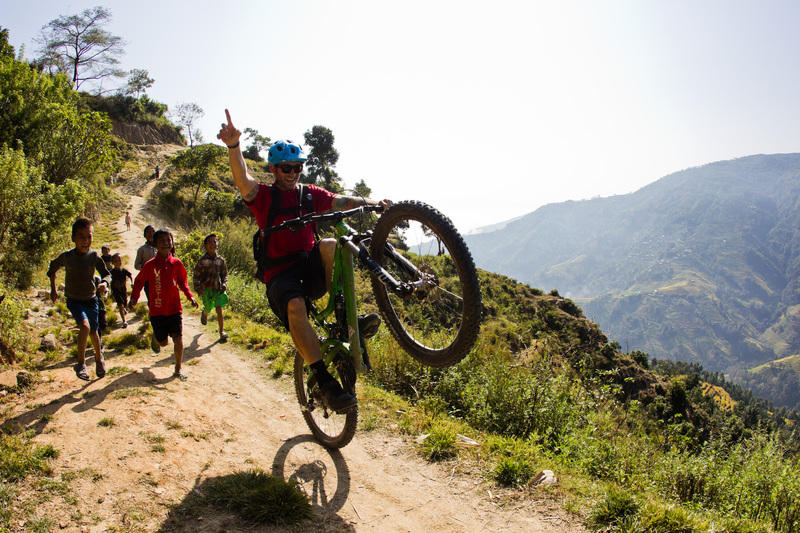 While there has been very little said about the riding in Nepal, we knew we weren’t going to be the first. That we weren’t the first doesn’t mean adventure and exploration is obsolete. It means we have to turn inwards to find it. 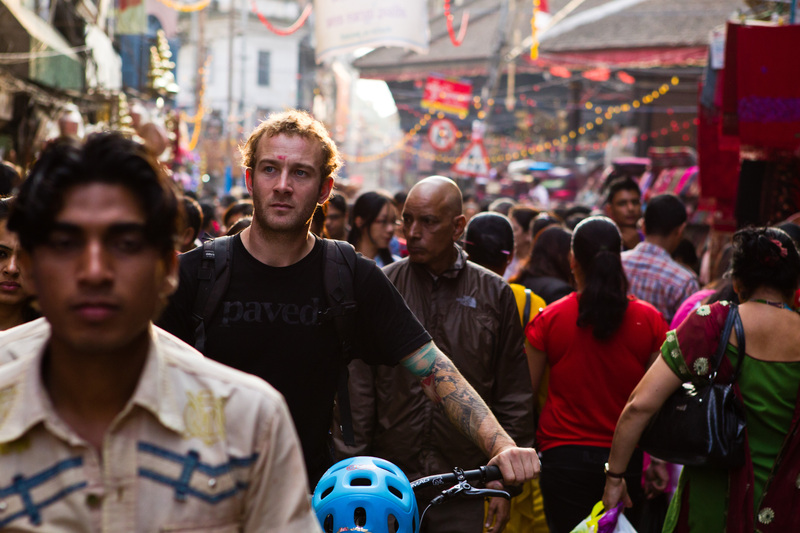 Our first taste of Nepal was a few days spent amongst the bustle of Kathmandu and riding the local hills. We would bump through the chaotic sprawl and wild city scenes to serene stupas and tranquil temples overlooking the city. From there we would hustle our bikes downwards through rooty, snot-covered, rocky jungle singletrack finishing back in the seething white-water rapids of vehicular mayhem and the turgid maelstrom of people. Traffic in Nepal has a different flow and it certainly has a different accompanying soundtrack. Horns are used incessantly by car drivers and motorcycle riders. At first it is uncomfortable as our ears are unconditioned to the constant barrage of blaring beeps. Then you realize that rather than a sonic bombardment of bad tempered road users it is actually a well-ordered and considerate orchestra. Whereas we regard a toot of the car horn as exceptionally brusque, in Nepal it seems it is a civil courtesy. The horn is an acoustic locator used to let others know where they are and what their intentions are, as basic road rules seemingly either don’t exist or aren’t adhered to. In our downtime we would wander through colourful market bazaars, crushed among the sea of people in an atmosphere more festival than commercial. I usually avoid such busy places and become uncomfortable in large crowds, but it was different here. Rather than the aggression that characterizes crowd mentality I found the throng benevolent, full of smiling faces and careful shunts rather than boisterous pushing. It was like being packed into a small nightclub with only your best friends. All the while the Himalayas towered above us to the north like breaking waves of rock. Early morning light would strike the peaks and appear like white caps on a tsunami. We were drawn towards them as if pulled by the force of a receding tide. We boarded a Twin Otter airplane and ascended towards the valleys and clefts of the Mustang district. I watched the shadow of our plane – worryingly sharp and close to life-sized – flicker over rocks, lines of prayer flags and straggling walls made of rough, round boulders. The Lower Mustang Valley was a landscape of windswept, naked rock and barren gravel. Grey, black and utterly white mountains rose beyond. The only other presence was the wind, which by afternoon would funnel fiercely up the valley. We weaved amongst tectonic formations to climb peaks and stand somewhat shoulder-to-shoulder with giant snowy summits. We drew breath in the rarefied air before the pull of the dusty descent gripped us with white-knuckle thrills. 2000 metres is a comfortable number when mountain biking. It’s a large enough number to be content that getting to it wasn’t a cakewalk and much of what we consider good biking takes place around this high mark. However, the Himalayas reach well above this number, so much so that 4000m is like playing in the sand box still. But to 4000m we climbed and I learned another thing: that the difference between two and four isn’t that great. The views don’t become marvelously imbued with ecumenical majesty, you don’t receive more clarity on love, life and the universe, and you certainly don’t have to worry about altitude lassitude. Even though it’s nice to fool yourself into thinking you are living at extremes and on the precipice of cerebral edema, any physical effect is probably exaggerated by the mind. Crossing the milky rush of rivers and passing through villages long ago established, we saw the villagers’ daily life of balancing survival and happiness, nature and spirit, man and god. In Muktinath, we witnessed the holy climax of pilgrims’ religious journeys, where they would cleanse themselves in the ‘hundred waters’ and give thanks to the eternal fire. 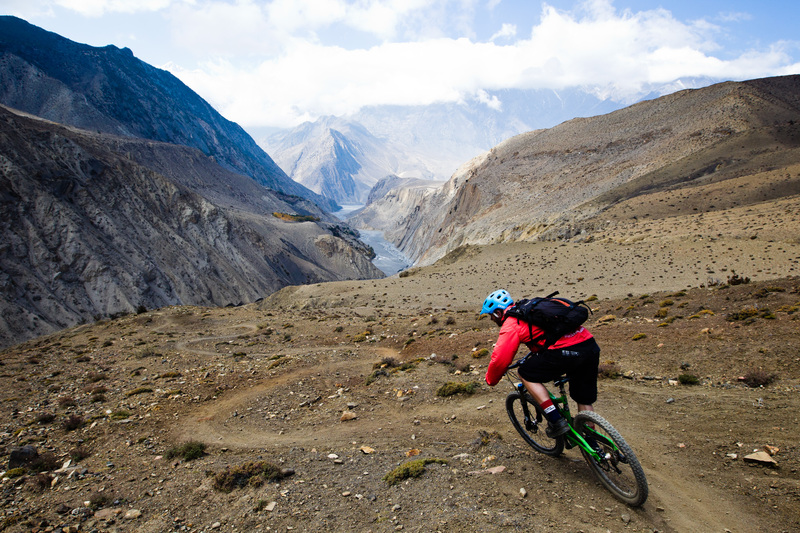 To leave the mountains we had to cycle south through the world’s deepest gorge: the Kali Gandaki. Our first colours came from the sub-alpine coniferous forests of blue pine, chir pine, Himalaya hemlocks and silver firs, juniper and scrub juniper that filled the crannied spaces where any soil had gathered. Descending into the lower valley, more vegetation began to flourish, leaves so thick and deeply green as to almost be black. Then the valley wriggled, dog-legged, and tightened until walls stood up much straighter and the immense height of the gorge could only be guessed and not eyed. After two days of riding we reached the town of Beni, marking the final revolutions of our pedals and the start of the long drive back to Kathmandu to collect our last souvenirs and pack up, readying ourselves for the long journey home. We weren’t pioneers, pirates or explorers plundering the delights of a new land. Anyone can do exactly what we did. All it takes is to have a stomach like a panzer and the ability to sit in a confined space and endure televisual pap until your bum goes numb. A mountain bike is a vehicle, and a vehicle is a device for travel. Even if you go no further than the woods at the bottom of your garden, you are exploring and seeing things that perhaps you wouldn’t otherwise. Every ride is an adventure even if you don’t take the road less traveled. You can ride the same trail repeatedly and each time you may experience something new. Travel is a way to focus on the within, and the surround. I had expected Nepal to be a frontier of mountain biking where we tackled the world’s biggest mountains on our performance bicycles. In fact, it turned out that the real challenge was coming to terms with the realization that nothing is untouched, the world is utterly colonized by homogenized cultural hitching posts and we were never going to be more than a dollar coin toss away from the luxuries of home. At first this was a depressing thought and I looked everywhere with a caustic scowl but then it became quite comforting to know that the biggest unknown is no longer what is out there in the coalesced globalized tourist-sphere. The thicket has been cut back and tracks have been laid. No longer are there the savage natives of mythology lurking in the shadows but rather there are helpful faces along these routes and a well made bed to rest in. Now we can enjoy hot tubs rather than cannibalistic hot pots. There are now roadways where there was once not map to mark the territory. Don’t bemoan the impact of our recreation, instead be thankful that we don’t have to hear anymore self-aggrandizing tales of adventure and exploration and we can now just go out into the world and try it for ourselves without having to remember to bring along a roll of toilet roll.